The game's done! I finished it before the deadline, but because I got it sponsored, it didn't end up releasing until today. It's up to the contest organizers whether or not it gets included! You can play it at Armor Games. I'm making a game about reading. It will play like a combination of Miner 2049er, Q*Bert, Gauntlet, and Wonderboy/Adventure Island. All of the graphics will come from the words of the stories and poems being read. Anything combining Gauntlet and Dante gets a gold star in my book. It's T.S. Eliot quoting Dante, I'm afraid. Does that still get a gold star? Sorry, it's been a long time since I read that poem. OK, anything combining Gauntlet and etherised gets two gold stars. Nice idea, looking forward to this. "The Love Song of J. Alfred Prufrock" is one of my all time favorite poems, hope you'll pull something great out of this. Well, it finally got released! I hope it gets included in the compo... I totally finished it on time. It just sorta didn't get released until now... ? I'd certainly like to see you with us! 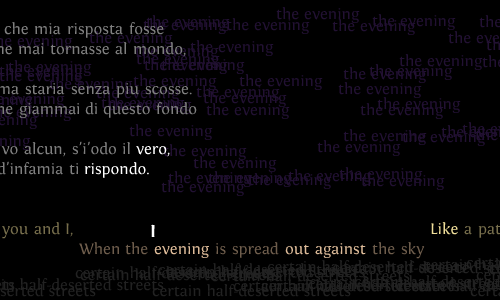 This is quite a beautiful game; I especially like the poetry presented in this manner (My favorite was E.E. Cummings' Buffalo Bill's). Sometimes, however, the level ended when I didn't want to, like in the Buffalo Bill's level, when I fell to the ground in hopes of getting more words. 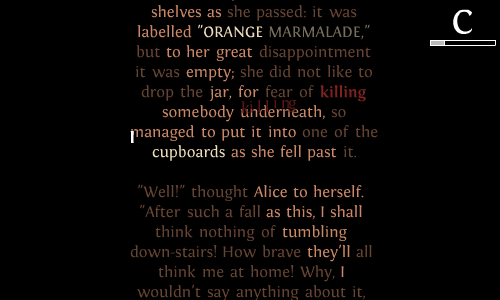 Also, the floating powerful words should be more visible; sometimes I hit them without even realizing it. What is that background piano piece? I liked it a lot. The music is from the "Photo Theme" series by Antony Raijekov. There's more at that link that I didn't use. You should have done a level that is just the actionscript for the game. I would have played through it if there was a level with code. Dude, I wish I'd thought of that. That'd be awesome. I quite enjoyed this game. The mood was great (thanks in large part to the excellent choice of music. The level design was quite creative in some of the longer pieces like The Nameless City, and it really added to the narrative. I see two main "problems" with this game. First is that it can't be good for the eyes. I played through all pieces except parts 2 & 3 of The Nameless City and by the end my eyes were sore. I doubt you can really do anything about this, but it's still a problem. Second is that actually reading the passages isn't really required in any capacity, so its value as an educational game is limited. Overall, I loved the game and would quite like to see future iterations with more passages. One thing that might actually help with this is a level editor, so players can do the work for you. Another possible suggestion is separate music tracks catered to match the mood of specific passages. Am I the only one for whom the game won't work? I really want to play it, too. and by the end my eyes were sore. Me as well, actually. I think it's an essential design flaw; in order to keep the text legible, it needs to be high-contrast, and that plus the constant movement seems to induce eyestrain. This a really beautiful game you've done, Gregory. Not that is one the most awesome games I ever played. I'll vote for you. I liked this game very much but I didn't know it's competition entry. Anyways, excellent work. Expectations were a bit higher during tutorial level but oh well. I found it quite often to be rather low-contrast actually. There's one aspect of the game that I'm uncomfortable with in some parts is, the music. I find it on the one hand to be very effective in that I found I could read very comfortably with it, and found it quite affecting. But the music also seemed to transform the game, at least for me, from being one which had the act of reading as something comfortably integrated, into instead a pensive and deeply sad regarding of an evocation of reading. Those are my current thoughts on the music anyway. My initial thoughts were more along the lines of "This music seeks to demote reading to the status of nostalgic masturbation, to subvert the text and transform it to an idle evocation of Gregory's Fond Memories of Reading, an almost unbearably kitsch condensation of everything that I despise about literature".